Sunday March 31 1907 I prepared things for dinner and went to church. Mr Clark gave us a fine Easter sermon. I came home and got our dinner and wrote some. A bright cool day. I did evening work and rested on the couch till time to go to bed. 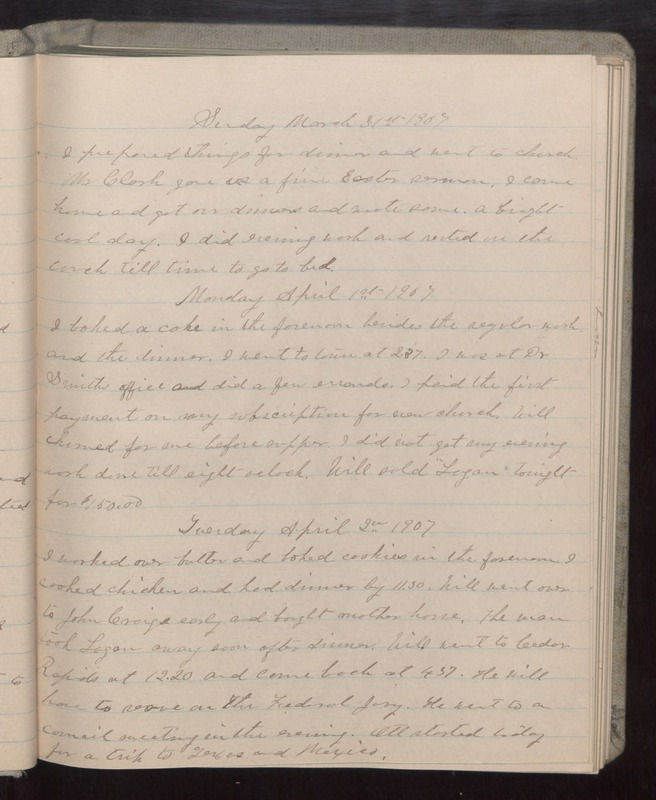 Monday April 1st 1907 I baked a cake in the forenoon besides the regular work and the dinner. I went to town at 2.37. I was at Dr Smiths office and did a few errands. I paid the first payment on my subscription for new church. Will churned for me before supper. I did not get my evening work done till eight oclock. Will sold "Logan" tonight for $150.00 Tuesday April 2 1907 I worked over butter and baked cookies in the forenoon. I cooked chicken and had dinner by 11.30. Will went over to John Craig's early and bought another horse. The man took Logan away soon after dinner. Will went to Cedar Rapids at 12.20 and came back at 4.37. He will have to serve on the Federal Jury. He went to a council meeting in the evening. Ott started today for a trip to Texas and Mexico.